I saw you on the ultrasound a few days ago. I cried when they told me you where a girl. I have dreamed of you for so long, and now you are real, and your Dad was just as over joyful as I was. My heart is just so full of happiness I can hardly stand it! I think about you all the time. It’s hard not to. You are always with me squirming around and kicking your tiny toes against my tummy my favorite part of pregnancy. Your brothers are all excited to meet you. They place their hands on my tummy to try to get a feel of you kicking. You often go all shy on them. I wonder if you will be shy. Your brothers are not shy at all. Your oldest brother has already written a song about you. Your middle brothers are going to smother you in kisses. You are already loved so much. I for one toss and turn at night thinking about getting up to feed you, holding and snuggling you in my arms. 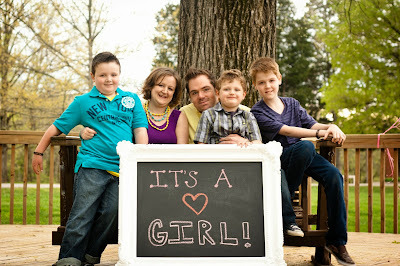 Wondering what you are going to look like, and what your little personality is going to add to this family. The excitement level is high, and I can’t wait to meet you my sweet girl. Girl I can’t believe I am saying that, I can’t believe how blessed I am, I can’t believe I will be holding you in only a few short months! How beautiful life is…….